Brecken grew up in northern Indiana, where he studied Environmental Studies at Manchester University, knowingly he wanted to pursue the great outdoors lifestyle. 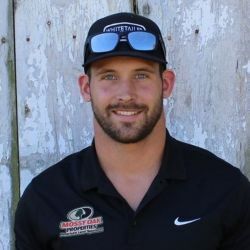 After college he purchase a free range whitetail hunting operation over in Pike County, Illinois called Farmland Trophies Outfitting, which he has grown to a well respected business in the hunting industry today. His outdoor activities include whitetails, turkeys, squirrel, pheasant, coyote, land management and athletics. He has learned many things while owning hunting operation but the most important thing he understands client relationships are most important.